I'm finally the owner of a peppermint candy cookie cutter, and that's what I used to make the spiders (some with a little witch hat added). I'm actually starting to see something other than the obvious in each cookie cutter. Maybe, just maybe, a teeny, tiny bit of Callye (The Sweet Adventures of Sugarbelle) is rubbing off on me, through osmosis:) As she says, "Think outside the cutter"! Callye is the QUEEN of cutter creativity! 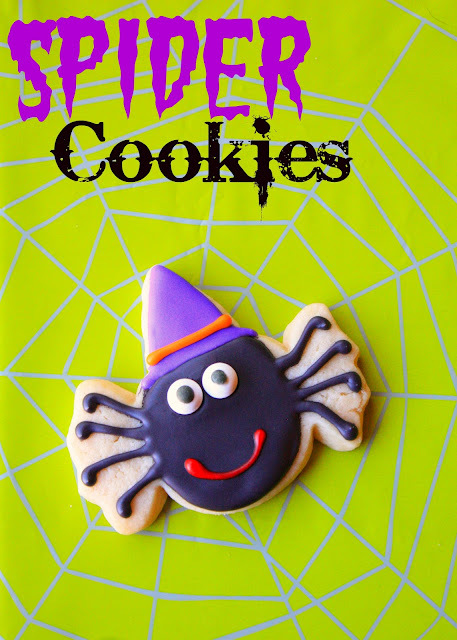 Sugar cookie spiders are the best, don't you think? The spiders are nade with my favorite sugar cookie/royal icing recipe. For the little hats, I cut out tiny triangles from the cookie dough and placed it directly against the top of the head before baking. For the eyes, I used pre-made candy eyes from Michael's. Squeel! These are so cute, love the ones with the hats and very smart of you to use your candy cookie cutter. So cute! And I would have never thought to do this, thanks for such a great idea!! The cookies is so cute! I want to get this cutter if I can. These are too adorable. :) What a creative use of the candy cookie cutter to make these spider cookies. Love those with the hats too. Love it! The perfect Halloween treat! These spiders are so cute! 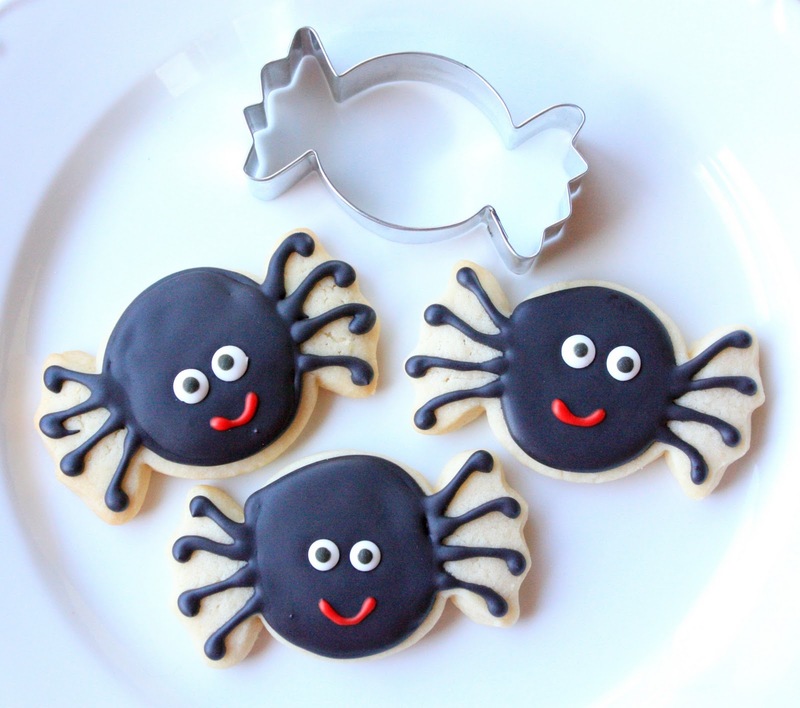 (And I never say that about spiders :) How smart of you to use the candy cookie cutter! I love this idea! So cute! I love seeing cookie cutters used for designs other than there purpose! Very creative! Sue, These are my favorite cookie you've made (so far);). OK, so I say that about every one you've ever made but it's the truth. I have a box full of cookie cutters. It's time to think outside the box, pun intended. Thanks for the inspiration. So creative. I love these creepy, but very cute spiders! Oh how clever to use that cookie cutter! Amazing! You are so clever and oh so talented!!! 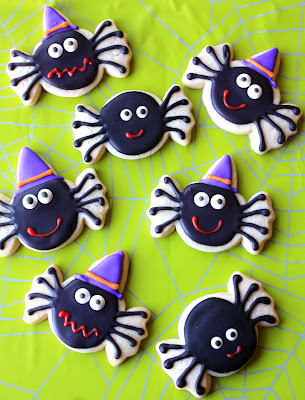 Those spiders look so cute! Ha ha ha.. I LOVE that you put little hats on them! LOVE, LOVE, LOVE!!! Those are some friendly looking spiders. I love that bit of advice!! I looked at that cookie cutter after you mentioned it...and saw the wrapped candy/peppermint. I'm so excited to get out my cookie cutters and do this! I used to make the Martha Stewart spider webs on Halloween because they're easy (flood with white...black spiral..pull through with a skewer - and of course you know this lol) but now I want to venture! Your spider are awesome, Sue! you did GREAT thinking outside the cutter!! I don't mind those spiders at all. They are as cute as can be! These are the sweetest and cutest spiders I have ever seen! So adorable and lovely! Beautiful!